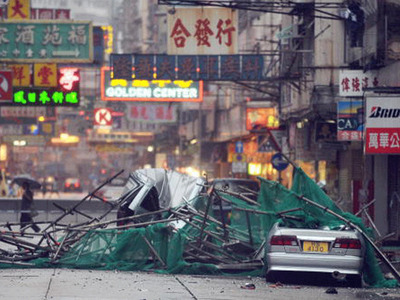 Getty Images/Mike Clarke/StaffFallen scaffolding brought down by high winds lies atop two vehicles in Hong Kong August 22, 2008. Hong Kong has had a rough year so far. Both exports of goods and services declined in the first quarter of 2016, a continuation of the territory’s downbeat trade outlook, and private consumption growth plummeted to less than half of its 2015 rate. , things are only going to get worse. Hong Kong’s performance earlier this year wasn’t an anomaly — it was an indicator of a long decline to come. Accordingly, BMI downgraded their 2016 real GDP growth forecast for Hong Kong to 1.2% from 1.7%, and cut its 2017 forecast from 2.2% to 1.7%. One of the reasons behind Hong Kong’s decline in momentum has been the territory’s economic links to mainland China, which has also been facing a growth slowdown. Earlier this year, Moody’s downgraded its outlook for Hong Kong from “stable” to “negative” in part because of the political riskiness of the connection. 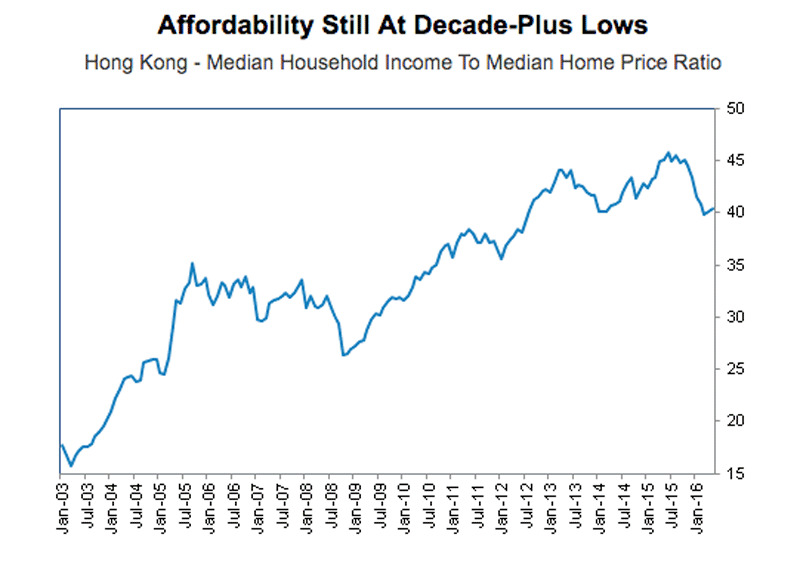 The bigger problem, though, is Hong Kong’s housing market. By some measures, it’s the most expensive housing market in the world — the median price of a home in Hong Kong is 19 times the median annual income, according to a Demographia survey earlier this year, and the median mortgage payment makes up more than 40% of total median income. The average Hong Kong home isn’t really affordable for the average household. The slowdown started, though, when home prices began to fall. Real estate prices had been increasing for years, until affordability reached its all-time low in August of last year. Then prices started dropping — a real estate correction that may make home purchases more affordable for some residents, but in doing so ushered in a period of slowing growth and consumption, as homeowners’ properties lose value. The graph below shows the decade-long rise in housing prices, and the recent drop after August 2015. And prices are likely going to keep declining in the near future, according to BMI researchers — which could have wide-ranging effects across the economy, in particular the financial services and construction sectors. As prices continue to fall, these industries, and thus the overall economy, are going to feel the brunt of the effects, and growth is going to continue to slow down for the time being.